Dogs with a high prey drive need diligent training to coexist with cats. You love both of them, but sometimes the relationship between Fido and Fluffy may best be described as "bloodthirsty." Training your dog to stop going after your cats is a process that takes weeks or months, not hours or days, and your cats' lives depend on your consistent diligence. Kennel your dog and securely close the crate door. Allow the cat into the room until the dog discontinues any aggressive or excited behavior. If your dog is particularly wigged out by the presence of your feline friend, you may need to cover the kennel with a sheet or limit this step to a few minutes each day, gradually increasing the length of exposure until they can coexist with your pup behind bars. Secure your cat in the cat carrier. Bring your collared and leashed dog into the room. Let him calmly investigate the crated cat. Any barking, growling or attempts to open the carrier must receive a firm "no" and immediate removal from the area, followed by another try. Alternate steps 1 and 2 until each animal is consistently calm. It may take many days, even weeks, to complete each step. If your leashed dog becomes uncontrollable, remove him from the room until he is calm. Do yourself and your pets a favor and take a basic obedience class. Use a braided nylon or leather leash no longer than six feet. Absolutely no extendo-leashes allowed! "Choke chains" have a bad rap because they can be grossly misused. Never yank a chain collar or give a "leash correction." The chain collar is useful because the dog cannot slip out of it while lunging for the cat, but it immediately loosens when he stops his hot pursuit. Sadly, your effort might never be completely successful. 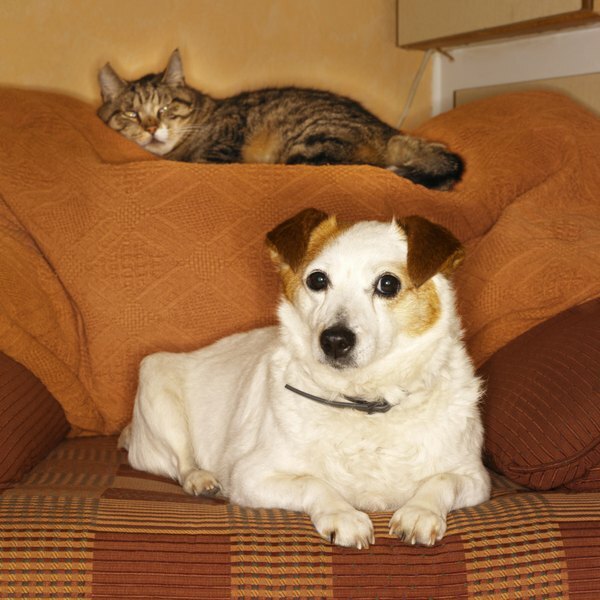 Keeping your cats in one piece around your dog requires your full commitment and diligent effort, but the temperaments of your pets also plays a starring role. Some dogs will never be trustworthy around your cats without you in the room, and some cats will insist on antagonizing dogs, or be ever-fearful. Others might someday become the best of friends -- with your careful supervision. If you bring a new pet into your home, you will have to repeat the process from scratch. Never assume that your dog will extend his friendship or training to a new cat, outdoor cat, neighbor's cat or felines at large. Does Different Music Affect Your Cat?